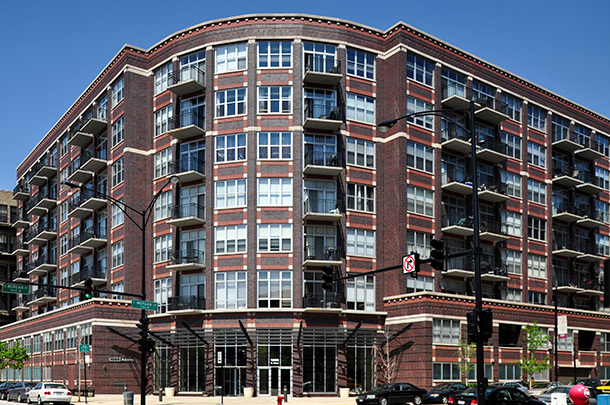 One of the first Mid-Rise residential buildings in Chicago’s West Loop neighborhood to offer loft-type units in a new-construction development, 1000 Adams is comprised of a two-story parking garage base with six stories of units above. The garage occupies the entire site, and is entered from Morgan Street. The residential floors above are organized into an ‘L’-shaped plan, intersecting with a glass-clad curve facing the street corner. Units on the street sides have impressive views of the city, while the units facing ‘inside’ look out over a quiet courtyard. The building lobby is located at the building’s curved corner entrance and has expansive views of the surrounding neighborhood. The residential units above feature the exposed cast-in-place concrete structure, large windows, private balconies and exposed duct work. The elevations reflect the context of the neighborhood’s existing vintage warehouse buildings, and incorporate expressed piers and brick spandrels, brick patterning, and limestone detailing.